The control of the different angiogenic process is an important point in osteochondral regeneration. Angiogenesis is a prerequisite for osteogenesis in vivo; insufficient neovascularization of bone constructs after scaffold implantation resulted in hypoxia and cellular necrosis. Otherwise, angiogenesis must be avoided in chondrogenesis; vascularization of the cartilage contributes to structural damage and pain. Finding a balance between these processes is important to design a successful treatment for osteochondral regeneration. 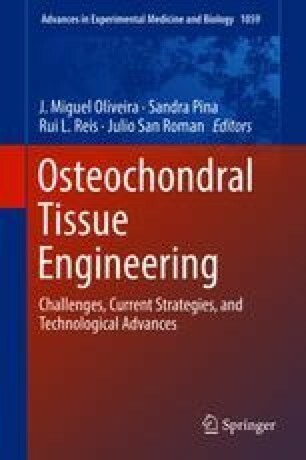 This chapter shows the most important advances in the control of angiogenic process for the treatment of osteochondral diseases focused on the administration of pro- or anti-angiogenic factor and the design of the scaffold.